On Friday, March 23rd MBF finalized the closing of a $50,000 loan to N.O.A. Café and Catering, a popular eatery in Miami’s growing Wynwood area. 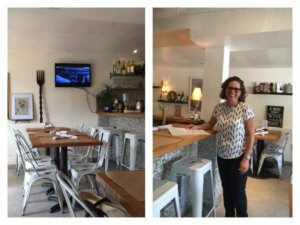 Adi Kafri, owner and heart behind the delicious Mediterranean and Asian fusion dishes, that have made her dining spot so popular with locals, is looking forward to growing the business located at 2711 NE 2nd Avenue in Miami. NOA started as a successful catering business 11 years and in 2011 Adi decided to open a stand alone restaurant. The MBF loan provide for an upgrade to the kitchen and add an expanded seating in a protected outside courtyard just in time for the busy season. NOA Café is one of the 45+ minority-owned companies that MBF has provided a loan to since 2011 in an effort to advance economic development in the City of Miami. Other companies that have received loans from MBF include, Barks and Tales Dog Spa, Sugar Yummy Mama, Magic City Chefs, FAMA Publishing, Two Coats Painting, Miami Smokers, Bunnie Cakes, BeeFree Media, Moonlighter,H.I.M-istry Naturals, and Medical Equipment Solutions.